Last week there was a SA Challenge posted regarding exploring your community. This is something I have been trying to do since I have moved to back to Lafayette, Indiana. I grew up in Lafayette but moved away while attending Ball State University. I have lived here again for almost a year but have been exploring different parts of my community recently. I recently went to the Farmer’s Market and an art exhibit in downtown Lafayette. The art exhibit featured local artists as well as artists from around the country. You could look at and purchase different types of art; it was really an interesting set up and displayed the pieces in a great light. I have been trying different local restaurants located throughout city. We have upcoming events that will display different restaurants, which I definitely will be attending. I recently attended an event called “Mosey Down Main Street” which displays all of the stores and restaurants on Main Street in downtown Lafayette. There were different booths set up and local musicians were set up on the street as well. There are several of these events throughout the summer and it is free admission for all in attendance. Over the weekend, I went to a local park and went to the zoo! It was a lot of fun. 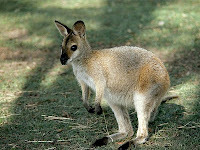 They have great exhibits with fun animals- the wallabies are my favorite! The park and zoo have really been revamped since I was in high school. Although it was very hot this weekend, it was still a blast! When I lived here as a teenager, I also thought there was nothing to do and had to travel out of town to do anything fun. However, now that I am living here as an adult, I find there are many fun and exciting places in the community. You have to seek out new places and find things that interest you. Now that I have discovered this, I love my community. Packing, Celebrations, Goodbyes, & Fun! Organize and Clean - How do you do that? 1 Year Semester at Sea Anniversary!!! Is a Ph.D. for me?